We are used to seeing our dogs romping around, but we often fail to pay close attention to canine gaits. The way a dog moves is of great importance when it comes to the show ring as moving flawlessly at a certain gait is required in certain breed standards. From a health standpoint, getting familiar with a dog’s normal gait is also helpful so dog owners can recognize any early signs of fatigue or possible lameness so they can report their findings to their vet. Last but not least, learning more about canine gaits is simply fascinating so to better get acquainted with our canine companions. So let’s take a stroll into the world of canine gaits. symmetrical or asymmetrical. What does this mean? In a symmetrical gait, the leg movements on one side are repeated on the opposite side. In an asymmetrical gait, instead the leg movements on one side are not repeated on the other side. Gaits are often referred to as 2-beat gaits, 3-beat gaits, 4-beat gaits. The beats, as in music, give an idea of the rhythm of the gait, they’re used to depict the times the feet touch the floor within a cycle. Dogs can show six different gaits, the familiar walk, trot and gallop, and the less less familiar amble, pace and canter. The walk is a symmetrical gait, in four beats, meaning that each foot touches the ground in a sequence, one at a time. In this gait, three legs are generally always on the ground, while one is lifted. Sometimes, very briefly, you can see though two legs on the ground when the legs being lifted and lowered slightly overlap. The pattern is left rear, left front, right rear, right front. Among all canine gaits, the walk is the slowest and less tiring. If we take a close look at a walking dog, we will notice how the head and neck lower when the front leg is lifted and rise when the leg is put down. By paying attention to this head movement, we can notice when it’s more pronounced, which may be indicative of discomfort or pain. When dogs are pulling a load, the walking changes slightly. The steps tend to become shorter and the head will be lowered more so that the dog’s center of gravity is shifted forward allowing the rear legs to help in propulsion. The trot is a symmetrical two-beat gait, meaning that two feet touch the ground at the same time. The pattern is is diagonal with the right front leg and left hind leg moving together and then the left front leg and right hind leg moving together. In this gait, two feet remain always on the ground except for a brief moment of suspension. This is an intermediate gait that is used when the dog needs to walk faster but without running. It’s an efficient gait used by dogs to cover long distances. The trot is also the most common gait seen in the show ring because it’s slow enough to be evaluated by judges. When judges ask handlers to move their dog in a trot, they’ll say “gait your dog, please.” This is also the ideal gait that can help owners and vets notice any lameness. Did you know? 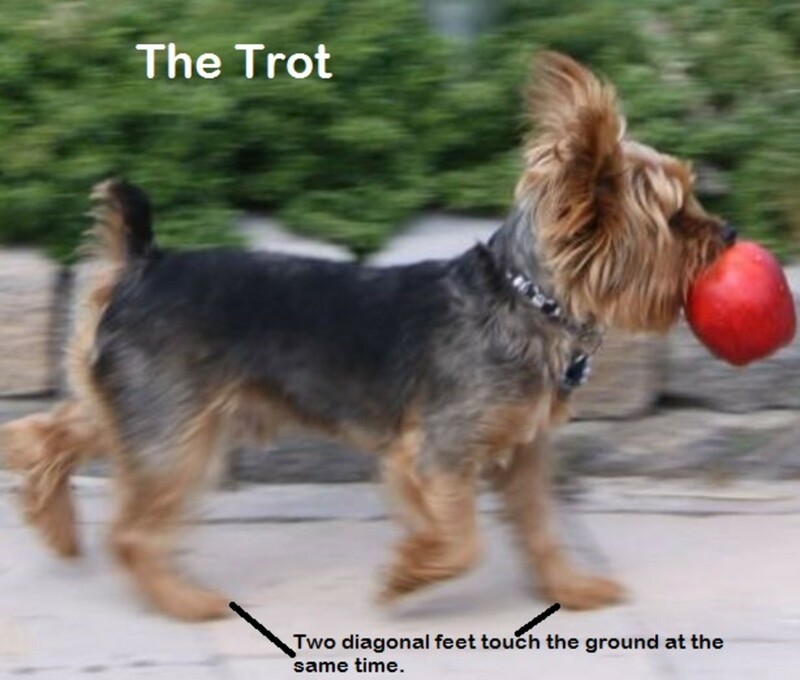 When a dog is trotting, in an ideal situation the rear leg moving forward should step right into the spot where the front leg on the same side left the ground just seconds prior. This is the fastest gait of all, but also the most tiring. It’s the typical gait dog owners refer to when their dogs are running fast. 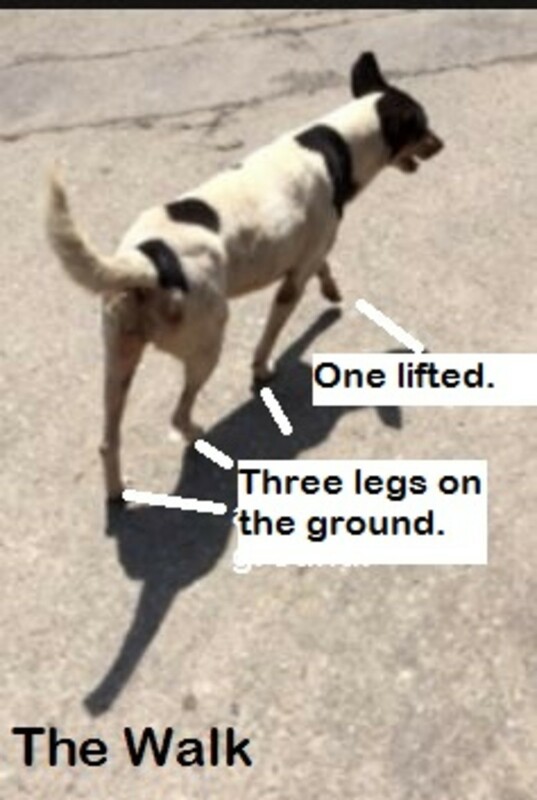 This gait is asymmetrical and has four beats with a suspension (all the dog’s four legs are lifted off the ground.) The gallop is faster than the canter. The gallop is sort of the opposite of the walk. In the walk there are always two or three legs on the ground, while in the gallop there are always two or three legs in the air, except during the suspension when all legs are lifted off the ground. In the gallop there are two possible leads, the left lead and the right lead. The lead refers to the order of leg placement, that is, which leg is the last to touch the ground before the suspension. This is a relaxed, often transitory gait that may be seen when a dog is speeding up in walking and about to break in a trot. This gait is symmetrical and similar to the pace, but just a tad bit slower. 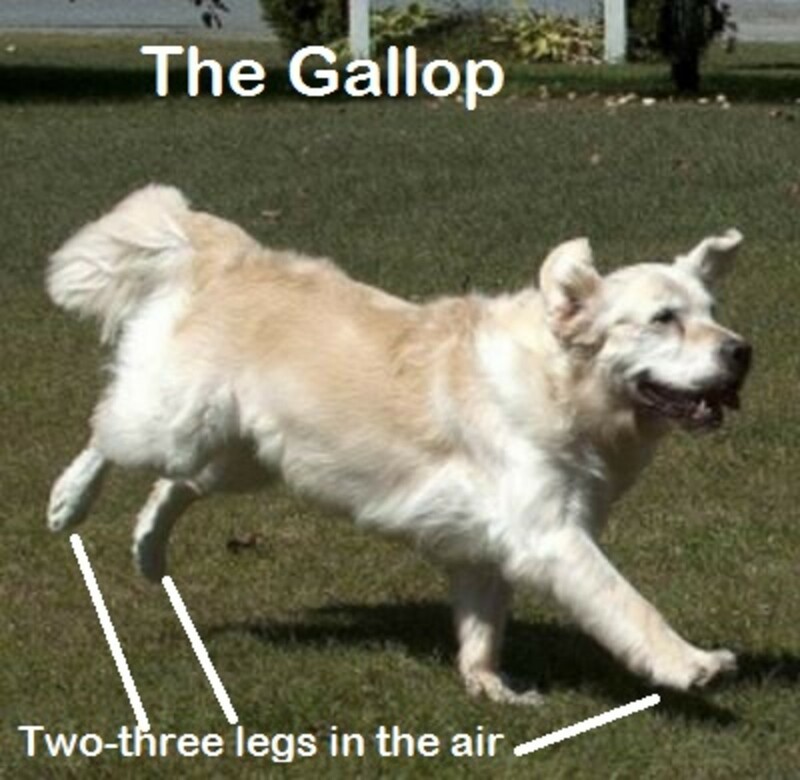 This gait is faster than the walk, but it’s slower than the canter and gallop, but, it’s rarely seen in dogs other than during the transition between one gait and another. This gait is more often seen in camels, elephants and horses. In this gait, just like the pace, two legs on the same side are lifted while the two other legs remain always on the ground, however if one looks carefully, it can be noticed that unlike the pace, the rear leg of the pair gets off the ground just a split second sooner than the front foot, and that the rear leg is also touches the ground a little earlier. “Amble: A relaxed, easy gait, in which the legs on either side move almost, but not quite, as a pair. Often seen as the transition movement between the walk and other gaits.” ~American Kennel Club. Some dogs will pace instead of trotting. Unlike the diagonal trot, the pace is lateral and it’s somewhat similar to the amble. This is not just a transitional gait like the amble, but rather something the dog will sometimes for prolonged times. The pattern is left front and left hind, right front and right hind. This gait gives the dog a rocking motion. This pace is temporarily seen in puppies when they are developing or fatigued dogs or in overweight dogs trying to conserve energy. In the show ring this gait is often considered a fault because it’s not energy efficient, however, it’s not penalized in these three dog breeds: old English sheepdog, Polish lowland sheepdog and Neapolitan mastiff. The pattern of this gait consists of two right feet on the ground and two left feet in the air, afterward, two left feet are on the ground and two right feet in the air. According to veterinarian Christine Zink, dogs who routinely pace may do so because they have a history of being walked by their owners at speeds that are in between the ideal walk and trot speeds or in dogs with some physical problem which makes trotting uncomfortable. For horse people, this is a familiar gait. The canter is an asymmetrical gait in three beats. The dog is propelled forward courtesy of the propulsion of the rear legs while the front ones work on steering and stabilizing. This smooth gait is slower than the trot and gallop and helps the dog conserve energy. The canter can be transverse (as seen in horses) or rotary (preferred by dogs). The pattern consists of rear foot, opposite rear foot and its front diagonal, and afterward, the other front foot followed by a possible suspension (moment where all four feet are off the ground. In the canter (as in the gallop) there are two possible leads, the left lead and the right lead. The lead refers to the order of leg placement, that is, which leg is the last to touch the ground before the suspension. Let’s face it: dogs win first prize when it comes to genetic variability in the whole animal kingdom. From the colossal Irish wolfound to the tiniest Chihuahua, it shouldn’t be surprising if all these genetic variances wouldn’t cause a variety of gaits because of dogs’ different sizes and structures. Here are a couple of unique gaits. The hackney gait as seen in the miniature pinscher. The double-suspension gallop as seen in the greyhound and whippet. This gait is asymmetrical and like the gallop consists of four phases. Unlike the gallop though, there are two suspension periods. 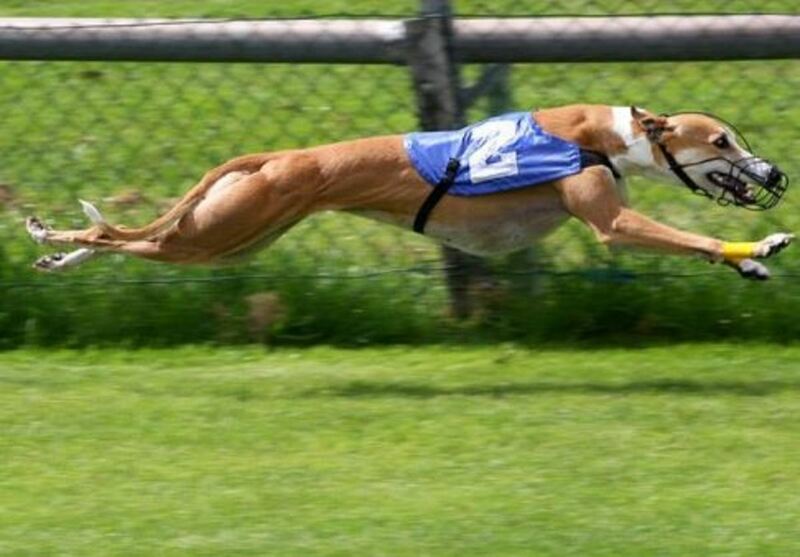 While this is the fastest gait, it doesn’t offer endurance, which is why greyhound races last very little. How Does Rain Affect Dogs?